Perusing my local Finishline (and House of Hoops) is something I do every couple of weeks, even if I don’t drop as much money on shoes as I used to. This time, I was in shopping for some multicolor Flyknit Roshe’s for my wife’s birthday. 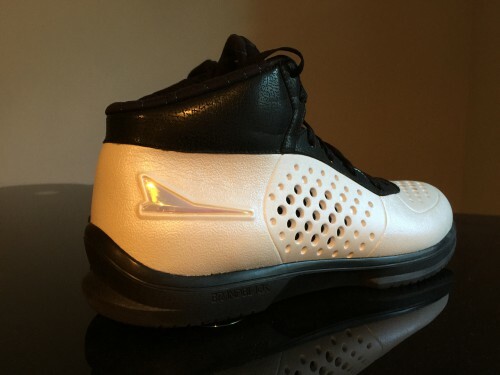 While I didn’t find a pair for her in her size, I stumbled across something that caught my eye: Brandblack’s Black Hawk, on clearance for a cool $55 (I promise I got her something else). I hadn’t gotten my hands on anything from Brandblack yet, but I’ve admired pretty much everything they’d done to this point, from their interwoven performance and aesthetic focus to their gorgeous sportswear line. The Black Hawk is an older model, yet hadn’t shown up at my store until now. It’s actually geared for the outdoor hooper, but I decided to put it to the test indoors and see how it held up. If you’ve read anything from me in the past, you know one of the ways to instantly compromise a review is poor fit. If I can’t get locked in the way I want, I won’t like the shoe (see my Crazy Light Boost 2015 review, for example). 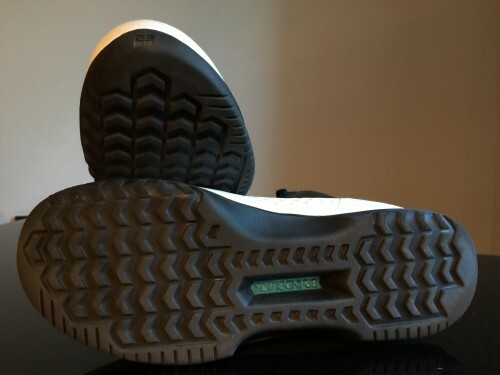 The upper on the Black Hawk is an interesting material – it feels a little foamy/spongy but isn’t overly stiff. In fact, it’s extremely pliable and flexible. There’s a circular cutout pattern (backed with fabric) throughout that has a bit of a Jordan 2010 Outdoor ethos (another shoe that I actually really enjoyed playing in). The collar area, is beefed up and features a nice quilted interior. An internal heel counter isn’t extremely sturdy, but does kind fit in with the rest of the upper design. I was able to get really good lockdown from heel to toe and the shoes lace up very nicely. I noticed a bit of slippage in the heel, nothing major, but still present nonetheless. I believe the heel counter could have been hardened or perhaps molded better, but it’s not bad for a shoe at this pricepoint. Overall, from a lockdown standpoint the Black Hawk is solid. It doesn’t use the highest quality materials nor is overly reinforced, but they lace up tight and are extremely flexible. This is an area of the shoe that I liked, although I definitely didn’t love it. 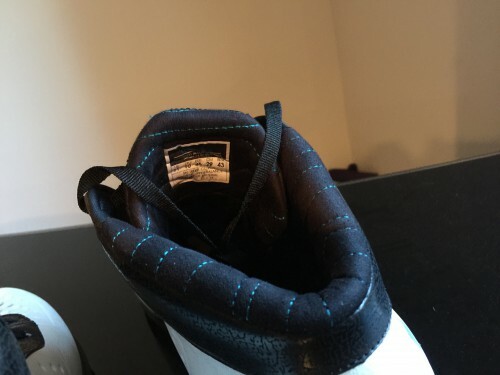 The midsole is fairly thin and flexible, and there are conflicting specs when it comes to the material. I’ve seen Jetlon and Multilon listed as the compound (they might even be the same thing) but either way I’d say it’s similar to Micro G in terms of bounce but in this particular application it’s not as firm or supportive. Court feel is great, but support is pretty much nonexistent. 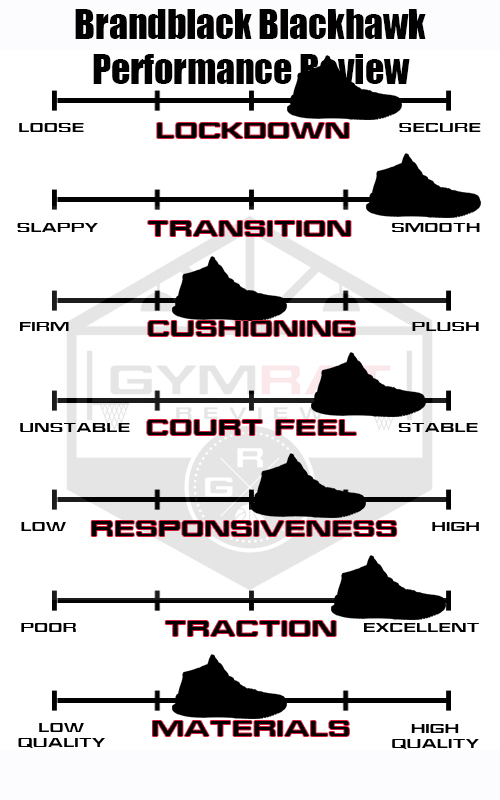 While I’m fairly light, I overpronate slightly and I definitely enjoy more support along the medial edge of the shoe. The Black Hawk unfortunately doesn’t help me much there, as the flexible midsole and upper both don’t provide much support. The forefoot outrigger was a nice design element and does aid in some lateral stability – especially important outdoors when you may not have great traction. Overall, I liked the responsiveness and the court feel but didn’t find enough support or impact protection. 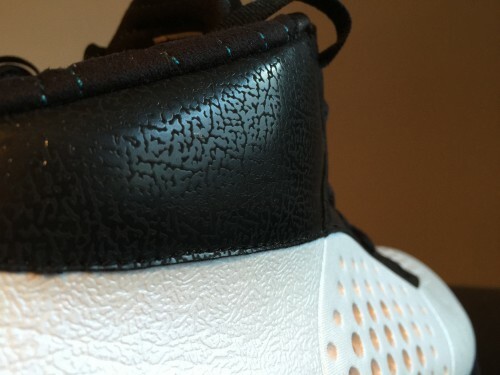 The outdoor-specific pattern has pretty wide, thick chevron-like lugs, but the rubber compound used is fairly pliable. The softer rubber plus the great flexibility I’ve mentioned before give the shoe great grip on the indoor courts I’ve played on. I was sort of surprised at the softer rubber on an outdoor shoe, but haven’t tested it outside yet. While I haven’t seen a ton of wear yet, the Black Hawk was built for balling outdoors so I’m going to give them the benefit of the doubt when it comes to their longevity. I’m not sure how the synthetic/foam type upper will hold up, but it’s done great so far. The collar and eyestays feature extra stitching and an extra layer of synthetic leather. 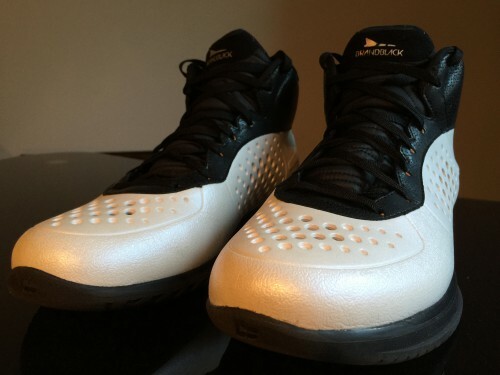 The insole was rather cheap as well, but not as bad as the Crazylight Boost! So far, so good on the durability side of things. In conclusion, the Black Hawk is a solid all-around performer from the up-and-comer in the performance footwear industry. While the JCrossover models feature fancier tech and higher quality builds, the Black Hawk is still good value when seen through the $55 lens. Compared to the budget models from the other major brands, the Black Hawk holds up pretty well. If you’re on the lookout for an outdoor pair or just a pair to keep others in your rotation fresh, the Black Hawk is worth a try. Yeah it’s different. It’s a pretty simple shoe from a construction and performance standpoint but it’s solid for a budget shoe. The Force Vectors always have intrigued me. I like the cut and the last looks fairly narrow, good for me at least. I have mixed emotions with the JC3. I think the shroud is really cool but wonder about its functionality. The Ether, which I saw a grey colorway of yesterday, doesn’t do much for me. Some beautiful shoes, but I’m a little hit or miss on them. Force vectors look good. Pretty much same as jc2 imo. Jc3 looks clean but shroud needs to go. Ether looks like a skate shoe to me. Sometimes I get tired of the “Air Force 1 vamp” design element too – where it wraps the toe cap then up to the bottom couple eyelets. I mean I get it provides support and all that, but I’m not a huge fan of the look. Blackhawks had it, so do JC3.